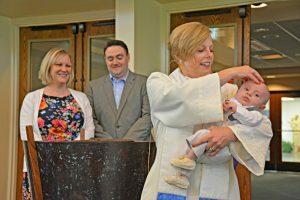 Most baptisms are performed as part of the worship service; part of the baptismal ceremony calls for the entire church family to take vows to help support the family and the one being baptized. Most often, children are baptized as infants, but anyone, of any age, can be baptized as long as that individual has not been baptized before. This church recognizes any other Christian baptism and we do not re-baptize. Please contact Rev. Dr. Kelly Brill, pastor@avonlakeucc.org, with any questions or to schedule a baptism.